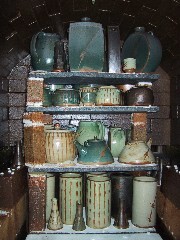 Many of the pots in the gallery have been fired in a wood-burning kiln. Humans have been firing pottery with wood for thousands of years. Though easier and less labor-intensive methods (gas, electric, etc) have been developed, some potters continue to fire with wood because it gives effects unlike any other method. Wood firers find coatings and drips of natural ash glaze particularly beautiful, either alone or in combination with applied glazes, rendering unique colors and textures. Wood firing also leaves more up to chance than most other firing methods, allowing the “kiln gods” to have a say. Many of the pots in the gallery were fired in a “manibigama” kiln designed by John Thies and Bill van Gilder who have built dozens of manibigamas across the country for schools and individual potters. While most other wood-burning kilns must be fired for days or even weeks to achieve good natural ash effects, this kiln can be fired to completion in less than 12 hours, with results that can rival much longer firings in much larger kilns. Bill and John built their most recent manibigama in September at the Leesburg home of Chris and Christy Cooley, with help from Chris, Chris’s cousin Ryan Brandt, and Richard Busch. Many of Chris’s and Richard’s pots were fired there this fall. Salt firing dates back to 15th century Germany, where potters discovered that throwing quantities of common salt in the kiln when it reached high temperatures caused a chemical reaction with the clay, forming an attractive natural glaze. At Glenfiddich Farm Pottery, the firing process is a two-stage event. The first step is the bisque (or biscuit) firing, in which leather-hard stoneware items —a variety of wheel-thrown and hand-built vases, bottles, plates, lidded jars, bowls, teapots, tea caddies, mugs, sake sets, planters, lamps, and others—are placed in an electric kiln and brought to a temperature of 1800 degrees F. When cooled, slips (coatings of liquified clay) are applied, along with brushwork or other decorations. Then the pots are fired again in the salt kiln, to a temperature of over 2350 degrees. The salt kiln is heated with two powerful propane burners, each rated at 250,000 BTUs per hour. Salting begins when the temperature reaches approximately 2100 degrees. About two pounds of dampened salt is put into the kiln at a time. The salt immediately vaporizes. The damper is closed down for several minutes to keep the sodium vapors inside the kiln, forcing them to react with the silica in the clay, thus forming the glaze. Then the damper is opened for several minutes while the kiln atmosphere clears. The cycle is repeated eight to ten times over roughly a two-hour period, until the quality of the glaze is right. During the procedure, small clay test rings—about the size and shape of napkin rings—are withdrawn from three spy ports, revealing the amount of glaze build-up. After salting, the kiln is brought to a temperature of over 2350 degrees. The whole firing lasts 14 to 15 hours and consumes about 80 gallons of propane gas. It takes three days for the kiln to cool down enough to be opened. Salt firing can be extremely unpredictable, and failures occur in every kilnload. However, it is this very unpredictability that potters find so rewarding (though the process is relatively expensive in terms of materials and labor), resulting in one-of-a-kind pieces. Aside from the natural warm browns that firing with salt produces, unexpected colors and marks often appear on pots as if by magic, sometimes with striking results. It is these and other effects—gifts from the kiln gods—that make salt firing so endlessly compelling.